ASIA NEWS RELEASE: Central sector of the capital targeted. Day labourers gather in the areas waiting for call up. Interior sources: Death toll destined to increase. Auxiliary of Baghdad: Tensions fuelled by delay in budget approval and the next parliamentary elections, scheduled for May. 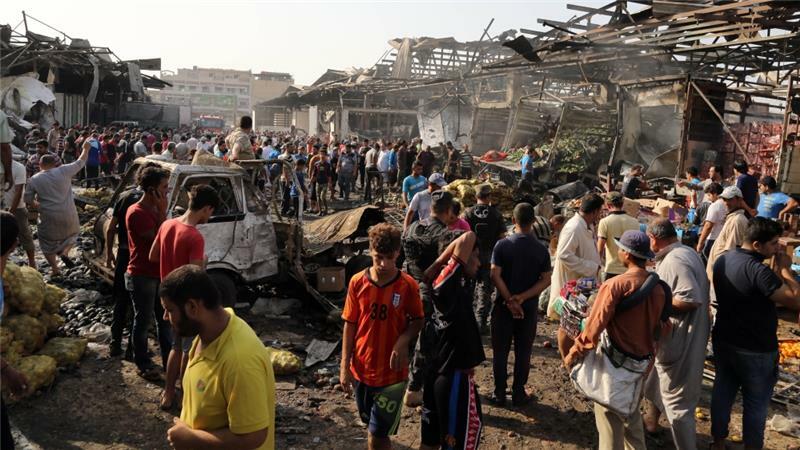 Baghdad (AsiaNews) - At least 26 dead is the still provisional toll from a twin suicide bombing that hit central Baghdad this morning. Most of the victims are day labourers, waiting for calls for a job. This is the second bloody attack in just three days that affects the capital of Iraq. Abdel Ghani al-Saadi, a physician and general manager of the Eastern Baghdad Department of Health, reports "26 dead and 90 injured", some of them in serious condition. General Saad Maan, spokesman for the joint command coordinating police and army operations, speaks of "16 confirmed deaths". "Two kamikaze - adds the high officer - blew themselves up on al-Tayaran square, in the center of Baghdad". Interviewed by AsiaNews, Msgr. Shlemon Audish Warduni, auxiliary bishop of Baghdad and right arm of the Chaldean patriarch, confirms that "the situation is not entirely calm", even though in the last period "the climate had improved". He adds that tensions are also being fuelled by “the delay in approval of the national budget and then the next parliamentary elections scheduled in May." He concludes “some people want to mix up the issues and foment tension, doing acts contrary to the nation. They are attacks that hurt, while we pray for peace and for the world to stops selling weapons". The scene of the attack is an important crossroads of business and commerce in the center of the Iraqi capital. It has also become a meeting and recruitment point for day labourers in the construction sector, who gather in the area in the early hours of the morning hoping to find a job. The area has been the scene of several attacks in the past, often deadly. Eyewitnesses tell of numerous ambulances rushing to the scene of the attack, in an attempt to provide assistance to dozens of injuried. Meanwhile, security forces have surrounded the area of ​​the kamikaze attack, which has not yet been officially claimed. Baghdad has experienced almost daily attacks since the summer of 2014, coinciding with the rise of militias of the Islamic State (IS, ex Isis), which conquered almost half of the territory. The offensive launched by the Arab-Kurdish alliance, supported by a US-led international coalition, has allowed the military defeat of the jihadists and limited the number of attacks; however, there remain some pockets of resistance or isolated cells ready to strike as happened this morning. In a note, the Iraqi Interior Ministry emphasizes that the budget is "destined to rise" due to the probable finding of further corpses in the context of rescue and clean-up operations in the area of ​​the attack. Over the weekend, a suicide bomber blew himself up near a checkpoint in the northern part of the capital, causing five victims.